I recently saw a question on SO relating to this, and pretty much every answer was: “Use LINQ To Xml”. Which is good advice. If you don’t want to do that (for whatever reason), then you may decide to use an approach such as the following. I am not stating that this is the best was to accomplish this, merely that it is a way. I am also not asserting that any of the books mentioned exist in the libraries they are listed under. 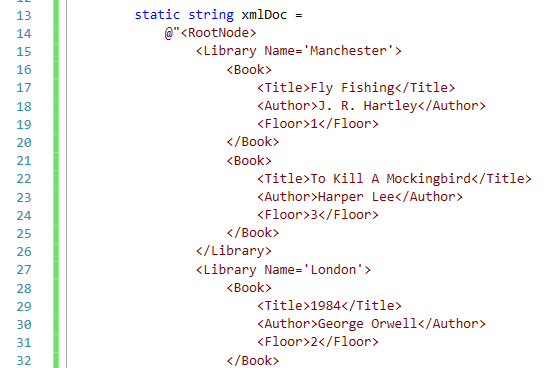 Declare the XML string here. Note; if you intend to read this from a file then just call Xml.Load() later on, instead of LoadXml. This entry was posted in C#, XML and tagged Attributes, Recursion, Xml, XmlDocument, XmlNode, XmlNodeList, XmlNodeType. NodeType on July 10, 2015 by pcmichaels.